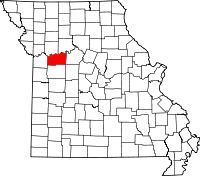 Lafayette County, one of a large number of counties in the United States named for the Marquis de La Fayette, the legendary French general who assisted the colonials during the Revolutionary War, was established in 1820, only a few years after Missouri was admitted as a state. Both the Recorder of Deeds and the Circuit Clerk are located in the county seat of Lexington, MO, with the Clerk in the Lafayette Hall on 116 S. 10th St, and the Recorder in the Lafayette County Court House at 1001 Main St in Room 207 on the 2nd floor. The Recorder is the custodian of property, marriage, and other records, while the Clerk is in charge of civil records, such as divorces, as well as criminal. The Lafayette County Health Department serves as the local source of birth and death records and is located at 547 South Business 13 Highway, also in Lexington.